Two years after the nightmarish events at Bright Falls and Cauldron Lake, Alan Wake finds himself in Night Springs, a town from a fictional television show he once worked on. Wake is still trapped in the Dark Place, an otherworld where the fabric of reality is malleable and can be changed by acts of creation. Wake is on the trail of his evil doppelganger, Mr. Scratch, who was created by the forces at Cauldron Lake and now means to destroy Alan's life in the real world. Wake must end Scratch's plans and find a way to escape the Dark Place. Alan Wake was Remedy Entertainment's highly ambitious, mostly-successful follow-up their iconic Max Payne action games. A mixture of thriller and action elements, combined with a light frosting of horror, it was high on atmosphere and story but the actual gameplay elements were stretched by a limited number of options. American Nightmare is a stand-alone follow-up, not a true sequel (Alan Wake 2 will likely follow in a few years), but also rather larger than the normal type of DLC expansion. The game takes place in three locations: a diner and garage on the outskirts of Night Springs, a nearby observatory and a drive-in movie theatre. Unlike the strict linearity of Alan Wake itself, these three areas are fairly large and open. Alan can explore each area at leisure, searching for weapons and collectible manuscript pages (which also flesh out the world and storyline) whilst fending off random encounters with the Taken. American Nightmare expands both Alan's arsenal (adding automatic weapons to his standard pistol/shotgun combo) and also the range of his enemies. The Taken now include 'splitters', single enemies who split into two enemies when hit with the flashlight beam, and guys who can transform into flocks of birds before reforming to attack. Also, scary killer spiders have also been added to the mix, but given they die the second you shine a light on them they are completely pointless. American Nightmare is heavily combat-focused. Taken attack in larger numbers and with more variety to their attacks than in the original game. However, this greater threat is negated by Alan's access to combat rifles and machine pistols, which can scythe through Taken ranks rapidly and with ease. Despite the more dangerous enemies, combat is much easier than in the original game (I didn't come close to letting a Taken touch me in the whole game). Unfortunately, the combat focus is necessary because of the lack of other elements. There are only three major characters for Wake to interact with, each of them a fairly typical spin on the 'damsel in distress' motif, and the puzzle elements are fairly basic. Alan has to find a few pieces of equipment in each area and combine them to defeat Scratch. A potentially interesting spin is introduced when Scratch is able to defeat Alan's plan and put him in a time loop, restarting the whole game. Characters retain their memories from the prior cycle, so, amusingly, are able to negate some of the more time-consuming tasks from before and carry out tasks in a more efficient manner. Whilst it's amusingly lampshaded, this repetition (the cycle goes round three times in total before the game ends) shows that Remedy are painfully trying to eke out as much length as possible from a very small number of assets. This is furthered by TV sets which Alan can switch on to receive threatening messages from Scratch, which go on for way too long in an attempt to push the gameplay time up to something respectable. Remedy have a good stab at making maximum use of limited resources, but by the end of American Nightmare's five-hour playing time the game feels exhausted. On the plus side, the writing is okay (though not as strong as in the main game itself), there's some knowing humour and some genuinely hilarious moments of bizarreness (playing a Kasabian track in a CD player causes a satellite to fall out of the sky and collide with an oil derrick...somehow). Combat may be easy, but it's also satisfying. Graphically the game remains impressive and it's good to see the engine handling the transition to an Arizona, desert-like location well. Those invested in the story and world will also find plenty of clues and easter eggs as to what direction the full sequel might take. 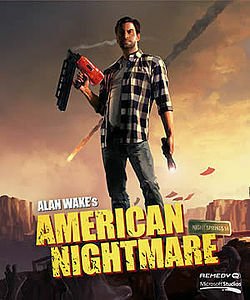 Ultimately, Alan Wake's American Nightmare (***) is a stopgap until the full sequel appears. It's short, easy and repetitive, lacking the atmosphere and more varied cast of characters of the first game, but whiles away a few hours entertainingly enough. It is available now on Steam and GoG (for PC) and on X-Box Marketplace (for X-Box 360).